Today we’ve tested a couple of newly assembled Active DI prototypes with practicing musicians and some curios listeners. This Active DI Box is a discrete op-amp based device with transformer-coupled output and Jfet input stage. We’ve started experimenting with the idea few months ago and development took some time. It was our first dive into the realm of discrete operational amplifiers. You are probably aware that discrete op-amp use is quite popular in pro audio equipment nowadays. They are widely used in DIY projects and mods, so we were curious how it was going to perform. The today’s first practical test with regular non-geeky audio folk was a great relief – our long work was not done in vain. Everyone involved have enjoyed the sound of the new Active DI box. So, we’ve finally had our answer for the long lasting question if discrete op-amp is really worth the hassle – yes, it surely does! There is no use in trying to describe the sonic properties in words, so just play the video below and take a listen. The sound was recorded using the discrete op-amp Active DI prototype PCB, which you see there. We’ve tried different types of Jfets. We’ve matched them, tested, listened and finally decided in favor of an LSK389 dual Jfet chip. It was a hard choice, as this device is expensive. Read – very expensive. And not that easy to get the continuous supply of. But putting the monetary issues aside, there was really nothing we could find that would come close to the performance of this dual Jfet. However, that’s the essence of pro audio DIY – you can use the best quality components. The ones that are barely ever used in medium-priced mass-produced equipment. The result is a stunning performance at the reasonable costs. 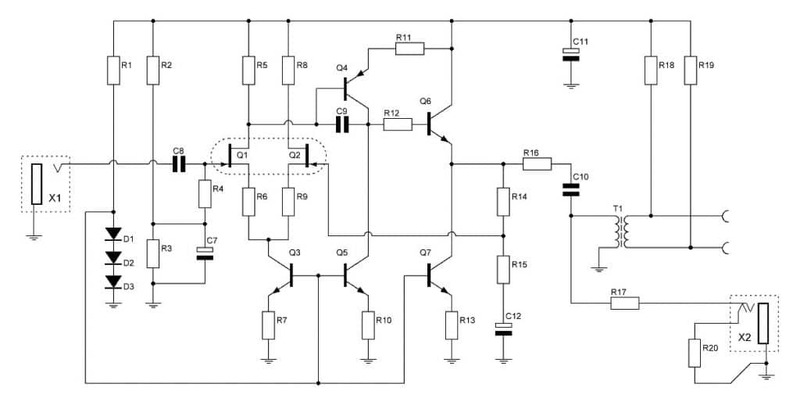 Below is a sketch of a Discrete Op-Amp Jfet Active DI schematic. No values, as final fine-tuning is to be done yet. It is a quite typical discrete op-amp circuitry adopted for a single rail power supply (phantom power). The output stage consists of a DC blocking capacitor and an output transformer. There is some more work to be done yet. Final fine-tuning of the circuit, PCB and enclosure adjustments, silkscreen design, component sourcing and general preparations for production run. However, hopefully you’ll hear about the initial pre-order soon enough! As usual, this discrete op-amp DI box will be available both as a kit and assembled unit. Don’t hesitate to write few words in comments below, we are always happy to hear from fellow DIY Audio folks. Moreover, your thoughts help us to understand what people are looking for in DIY pro audio kits. Posted in R&D Notes and tagged active di, direct box, discrete op-amp. Any progress on this product? Very interested.